Kwame Alexander We are pleased to welcome a last minute addition, children’s author and poet Kwame Alexander, with his most recent title, Crossover. Twelve-year-old twins Josh and Jordan play basketball but have family issues to contend with as well. So this is one great middle grade novel of sports, family and brotherhood. Meet the author at Anderson’s. Kwame Alexander is currently considered a "single author." If one or more works are by a distinct, homonymous authors, go ahead and split the author. 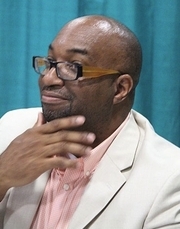 Kwame Alexander is composed of 1 name.